Endonuclease V (EndoV) is a metal-dependent DNA repair enzyme involved in removal of deaminated bases, with pairing specificities different from the original bases. EndoV has been combined with DNA ligase to develop an enzymatic method for mutation scanning and has been engineered to obtain variants with different substrate specificities that serve as improved tools in mutation recognition and cancer mutation scanning. However, at the date of our analysis, little was known about the structure and mechanism of substrate DNA binding by EndoV. Thus, by combining fold-recognition, comparative modeling, de novo modeling and docking methods, we constructed a structural model of EndoV from Escherichia coli in complex with dsDNA and cofactor metal ions. The model has allowed us to provide a structural context for sequence conservation within EndoV proteins family, and to highlight the previously obtained mutations that have been shown to change its specificity. Shortly after the acceptance of the final version of our manuscript , the crystal structure of Thermotoga maritima EndoV was published  giving a possibility for direct comparison of our model with the native structure of the close homolog. Our modeling can be considered successful, as it correctly predicts EndoV topology as well as the position of all catalytic residues and several residues taking part in protein-DNA interaction. 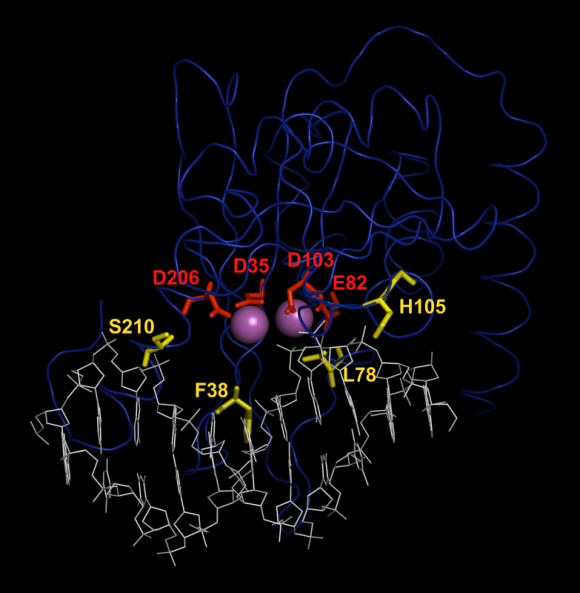 Although our model contains two cofactor Mg2+ ions and the crystal structure of TmEndoV contains only one, authors agree, that in organisms like E.coli, where Asp is the last catalytic residue of EndoV (TmEndoV contains His), the two-metal binding site would be preferred, with the second Mg2+ cation functioning as a bridge to diminish the phosphate-carboxylate electrostatic repulsion. 1. Majorek KA, Bujnicki JM. “Modeling of Escherichia coli Endonuclease V structure in complex with DNA.” (2009) J Mol Model. 15(2):173-82. 2. Dalhus B, Arvai AS, Rosnes I, Olsen OE, Backe PH, Alseth I, Gao H, Cao W, Tainer JA, Bjoras M. “Structures of endonuclease V with DNA reveal initiation of deaminated adenine repair.” (2009) Nat Struct Mol Biol. 16(2):138-43. 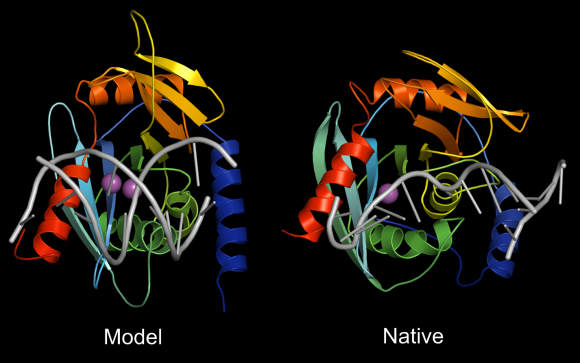 Comparison of structures of our model and the native structure (PDB code: 2w35).Structures are colored according to the sequence index (N-terminus – blue, C-terminus – red). All the secondary structure elements and the region of catalytic core are modeled correctly. Correctly predicted functionally important residues of EcEndoV.We correctly predicted the position of catalytic/Mg2+ coordinating residues (red sticks) and several DNA contacting residues (yellow sticks).